I hope President Jonathan, his advisers and all state Governors can now prioritise job creation across all Nigerian states in order to save the lives of the unemployed youths. The rise in crime and insecurity in Nigeria is because the Youths are not empowered to own their businesses or gain employment. Small businesses have no access to unsecured loans from banks etc. An unemployed engineering graduate of Ekiti State University, Mr. Sunday Omotayo, was on Wednesday prevented from committing suicide by the police and prison officials. Omotayo, who caused a stir along Wellington Bassey Way, Uyo, Akwa Ibom State capital, when he deliberately jumped out of a speeding Toyota Hiace bus, expecting to be crushed to death by other vehicles, said he was tired of life as he had been searching for a job for the past 10 years after graduation. Some policemen, who were on patrol at the time of the incident, told our correspondent that Omotayo had in the morning gone to the state prison asking the officials to either kill him or make way for him to rot in the prison. A prison officer, who craved anonymity, told our correspondent that they saw him – well dressed and wearing a tie – running towards them. He added that his action forced them to become alert with their guns. The official stated that Omotayo was later overpowered by the police, who counselled him and forced him into a bus heading towards the Ibom Plaza roundabout. An eyewitness, Mr. Effiong Bassey, said Omotayo jumped from the bus into the major road for other vehicles to run over him. 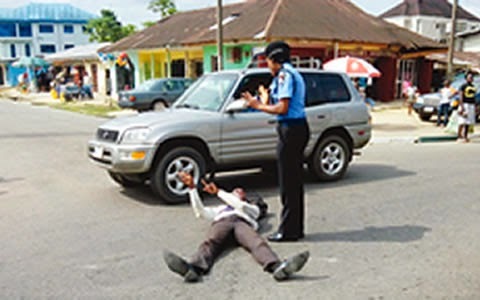 Lying on the main road leading to Akwa Ibom Government House, It took a while for policemen to get him out of the road. He insisted that he must put an end to his poverty-stricken life by committing suicide. Omotayo told PUNCH Metro, “There is no state that I have not gone to in search of a job in the past 10 years. I came to Akwa Ibom because this is my last hope because of the stories of Governor Godswill Akpabio and his uncommon transformation. The Police Public Relations Officer, Akwa Ibom State Command, Mr. Etim Dickson, promised to get back to our correspondent once he had confirmed the story from the Divisional Police Officer in charge of the area. This entry was posted in General Emotions for singles, dating, married, Divorced, News, Politics and tagged Mr. Sunday Omotayo Attempts Suicide, NIGERIA: Police Officials Prevent Jobless Graduate From Committing Suicide In Uyo.